Another day, another desperate attempt at regaining lost youth by a famous celebrity starlet. On today's menu is Melanie Griffith, the golden globe winning actress who has starred in countless blockbuster movie hits such as, Working Girl and Another Day in Paradise. 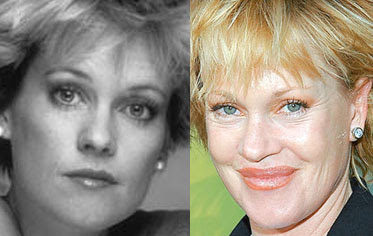 Melanie Griffith has underwent several plastic surgery operations in recent years, and we will surely be covering all of them in due time, however today we are taking a close look at her unusually large plump lips. Melanie went from having cute natural lips, to the dreaded trout pout collagen nightmare, which is all too common these days. looks demented after surgery, what blockbuster movies except working girl has she starred in?